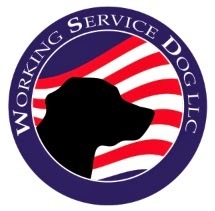 Working Service Dog Blog: How Much Identification Do You Need for Your Therapy Dog? How Much Identification Do You Need for Your Therapy Dog? How much does the public really know about a therapy dog? The first thing they should know is that therapy dogs are trained to provide comfort to help elders in nursing homes, victims of disaster areas, visit schools and other visitation areas helping others manage their stress. However, the second and equally important thing they need to know is that a therapy dog does not have the same rights as a service dog. Although service dogs are protected by government laws, a therapy dog is not. He may not be able to access the same areas a service dog could. Therefore, identification may be used to help the public understand how he helps others in a public setting. We have listed several means of therapy dog identification that you can use to show that the animal is clearly a therapy dog. This will help avoid any possibility of misrepresentation in public, while allowing others to see the benefits of how a therapy dog can help them. A vest is a clear signifier that a dog in a public place is not just a pet but is helping their handler or helping others as a Therapy Dog. Many people who see a dog wearing a vest associate them with service dogs, so it is of the utmost importance to ensure the therapy dog wears a therapy dog vest. This is a vest that has patches attached to it that clearly say in bold letters: “Therapy Dog.” These vests may also store an ID card for further identification. When it comes to providing professional-looking identification upon request, a therapy dog ID card can be very useful. When asked about the therapy dog, you may provide an ID card that clearly states your name, your dog’s name, or your organization, and the words “Therapy Dog.” These cards can help clear up any misconceptions about whether your dog is a therapy dog or service dog. As we mentioned before, patches attached to therapy dog vests are a good way to identify a dog as a therapy dog. You may use additional patches that say valuable information like “Disabled Veteran,” “U.S. Army,” and U.S. Marines” to provide more context to your dog’s function in a public setting. Additional patches may be added to your dog’s vest or may be attached via clip-on patch tags. You can find other accessories to help you identify a dog as a therapy dog, including window decals and keepsake cards. These can be helpful, but their use will depend on where you are going with the therapy dog. Wherever you choose to go with a therapy dog, just be sure to have several methods of identification such as therapy dog patches and ID Cards.